The story of how this group of young friends from Birmingham transcended their working-class origins to become the world’s most successful reggae band is not the stuff of fairytales as might be imagined. The group’s led a charmed life in many respects it’s true, but it’s been a long haul since the days they’d meet up in the bars and clubs around Moseley, and some of them had to scrape by on less than £8 a week unemployment benefit. The choice was simple if you’d left school early. You could either work in one of the local factories, like Robin Campbell did, or scuffle along aimlessly whilst waiting for something else to happen. By the summer of 1978, something else did happen, and the nucleus of UB40 began rehearsing in a local basement. Robin’s younger brother Ali, Earl Falconer, Brian Travers and James Brown all knew each other from Moseley School of Art, whilst Norman Hassan had been a friend of Ali’s since school. Initially, they thought of themselves as a “jazz-dub-reggae” band, but by the time Robin was persuaded to join and they’d recruited Michael Virtue and Astro – who’d learnt his craft with Birmingham sound-system Duke Alloy – the group had already aligned themselves to left-wing political ideals and forged their own identity, separate from the many punk and Two Tone outfits around at that time. The group had nailed their colours to the mast by naming themselves after an unemployment benefit form. Their political convictions hadn’t been gleaned second hand either, but cemented in place whilst attending marches protesting against the National Front, or rallies organised by Rock Against Racism. UB40’s first album was released the following September, on Graduate Records. Their deal allowed them more creative freedom than if they had signed with a major label. The cover artwork memorably duplicated an unemployment benefit card, with the title “Signing Off” rubber-stamped in red, but it was the music that quickly worked its way into the affections of a young, mainly student crowd with its knowing lyrics, solid reggae rhythms and dubby, instrumental passages, offset by warm horn solos and Jamaican style scatting. There was nothing else like it at the time. As a multi-cultural band from Birmingham, UB40 weren’t drawn into trying to sound “authentic,” and there was considerably more depth to their music than that of many punk and 2Tone bands. “I’m a British subject, not proud of it, whilst I carry the burden of shame,” they sang on one of the tracks. Accepting the truth of their own situation amidst a sea of other reggae songs proclaiming black heritage gave us a valuable insight into where UB40 were coming from. They were unafraid to stand up and be counted, and British audiences instinctively loved them for it. “Signing Off” duly went to No. 2 in the UK and stayed on the nation’s album charts for 72 weeks. The first was released in the summer of 1983, and contrary to past record labels’ expectations, the change of direction worked magnificently. Labour Of Love became the band’s first No. 1 album in the UK, and would remain in the British charts for eighteen months. Lead single “Red Red Wine” also went straight to No. 1. In fact it stayed in the British charts for two years, thereby giving them their first truly worldwide hit and, eventually, their first American No.1. They were now recast as Britain’s foremost reggae ambassadors. They have arguably fostered a love of reggae music in more people than any other artist, including Bob Marley, and it started just as soon as they’d introduced timeless Jamaican classics to contemporary audiences on “Labour Of Love.” “Please Don’t Make Me Cry,” “Many Rivers To Cross” and “Cherry Oh Baby” were the other hits from that seminal first edition, which went on to sell more than ten million copies worldwide. UB40’s next single, “If It Happens Again,” went to No. 9 but the album it was taken from, “Geffery Morgan,” wasn’t a success by previous standards, despite a return to hard-hitting, reality topics on tracks like “Riddle Me,” “As Always You Were Wrong Again,” “You’re Not An Army,” “The Pillow” and “I’m Not Fooled So Easily.” Recorded at The Abattoir, “Geffery Morgan” whilst not selling in the same numbers as “Labour Of Love” like “Baggariddim” – a collection of tracks recorded with leading British reggae MCs – awaits urgent, critical reappraisal. In the summer of 1985 UB40 joined forces with Chrissie Hynde for a cover of Sonny & Cher’s “I Got You Babe” that promptly flew to No. 1 in the UK. “Don’t Break My Heart” also went Top 3 shortly afterwards, confirming them as Britain’s most successful reggae band. Before long, they were again breaking new ground by becoming one of the first western groups to tour the Soviet Union. Their watershed concert in Moscow was recorded and released the following year as “UB40 CCCP.” It was their second live album – the first, “Live,” had been released in February 1983. In August 1986, “Rat In The Kitchen” became their sixth Top 10 album in the UK. The title track became the first hit off the album, whilst “Sing Our Own Song” had been written in support of black artists in South Africa – this during an era when South Africa was still an apartheid regime, and Nelson Mandela regarded as a terrorist by Britain’s Prime Minister, Margaret Thatcher. By 1994, the constant touring had taken its toll and the band was ready for a well-earned rest – this after playing to record crowds around the world, including South Africa, where they performed to over 250,000 people in total. Virgin would fill the gap by releasing “The Best Of UB40 – Volume Two,” containing hits like “Kingston Town,” “Here I Am” and more recent efforts such as “Bring Me Your Cup,” “Reggae Music” and “Until My Dying Day.” During their sabbatical from the group, several of the members worked on their own musical projects. Robin and Ali made a guest appearance on Pato Banton’s No. 1 hit “Baby Come Back,” whilst Earl would have success producing house and drum & bass tracks. Ali Campbell also released his debut solo album “Big Love,” which he’d recorded in Jamaica. Their adventures in Jamaica will result in several, celebrated encounters with various reggae legends. The first, “UB40 Present The Dancehall Album,” featuring Jamaican acts like Beenie Man, Mad Cobra and Lady Saw, appeared in 1998, and “The Fathers Of Reggae” in 2002. Robin has described the latter as one of the highlights of their career, since it featured many of the artists who’d inspired them (among them Toots Hibbert, John Holt, Alton Ellis and the Mighty Diamonds), singing the group’s own material. Were it needed, the “Fathers” set offered proof of the respect UB40 have always been accorded in Jamaica, and especially among the island’s artists and musicians. The “Fathers” album had taken three years to record, and the follow-up their set, “Guns In The Ghetto,” would also take longer than expected to reach fruition. The group had reconvened in 1996, when they appeared in the film “Speed 2,” starring Keanu Reaves and Sandra Bullock. They perform “Tell Me Is It True” in the movie, which duly became the lead single (and a Top 20 hit) from “Guns In the Ghetto”, released the following year. Ali described “Guns In The Ghetto” as sounding like “a reggae record, made in Jamaica proper.” It peaked at No. 9 on the UK album charts, and yielded just one further single, “Always There.” “Guns In The Ghetto” eventually sold over a million copies, but suffered from the band’s unwillingness to tour. Other landmark shows would soon follow, including concerts in South Africa, and at a peace concert in the Sri Lankan capital of Colombo. One of them, in Switzerland, was later released as “Live In at Montreux.” In 2003, they received an Ivor Novello Award for International Achievement and secured another Top 10 album with the “Platinum Collection”, a triple box set comprised of the entire “Labour of Love” series. By now, they had been favourites of the British public for well over two decades. It was therefore fitting they should provide the official anthem for the England rugby team’s triumphant 2003 World Cup campaign in Australia. “Swing Low,” taken from the “Homegrown” set, will become the group’s 49th UK chart single. UB40 have now had 51 chart successes, the only bands to have notched up more hits are Status Quo and Queen, but for them to achieve this distinction by playing reggae music is nothing short of miraculous. At the beginning of 2008, Ali Campbell decided to leave the band in order to pursue a solo career. With a minimum of fuss, he was replaced by another Campbell brother, Duncan, who has a voice that’s virtually indistinguishable from Ali’s. Duncan had been invited to join the band at their inception, but declined. 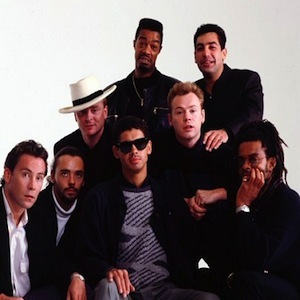 However, some thirty years later alongside the other UB40 vocalists he has made his presence count on the latest album “TwentyFourSeven,” which received widespread acclaim on its release during the summer of 2008. Following on from “Who You Fighting For”, “TwentyFourSeven” was again recorded “live” in the studio, and thus showcases them at their best. Not for the first time, the choice of material was dominated by the kind of searching, political messages they’d long been famous for. Songs like “Rainbow Nation,” “End Of War,” “Oh America” and “Securing The Peace” rank alongside their best-ever reality tracks, except with guest singer Maxi Priest taking over lead vocals on “Dance Until The Morning Light” and a cover of Bob Marley’s “I Shot The Sheriff”, the mood is celebratory as well. Freed of the need for hit singles (if not hit albums), they sounded rejuvenated, as if they’ve rediscovered the creative spark that inspired them in the first place. The results make essential listening, reaffirming their reputation as the world’s most successful reggae band as they continue to reach out to audiences that are impossible to categorise by race, age or nationality. 2009 saw the release of the compilation ‘Love Songs’, which made #3 in the UK album charts, before the band played a series of live dates in North America, Italy, Germany, Spain and Slovakia, to name a few. 2010 was another busy year for the group; in February they released “Labour of Love IV”, the band’s first full album with Duncan Campbell on lead vocals, which reached #24 in the UK album charts, before celebrating the 30th anniversary of their debut album, ‘Signing Off’, by releasing a Special Edition of the album. To coincide with the release, they embarked on a sell-out tour of the UK where they played the album live in its entirely. This tour was preceded by a warm-up date at The Hare & Hounds in Kings Heath, the venue where the band made their live debut on February 9th, 1979. On September 2nd, 2013, UB40 released their new album ‘Getting Over The Storm’ on Universal/Virgin Records, played a string of UK tour dates in support of the release.